Enter the world of Robert Kirkman’s The Walking Dead! Become a player and take on the role of a survivor in a world suddenly full of zombies. With only one companion at the start of the game, each player must struggle to gather resources, find other survivors, and eventually find a refuge from the zombies that have taken over the landscape. Can you find enough resources and scout enough locations to find a safe haven to escape to? 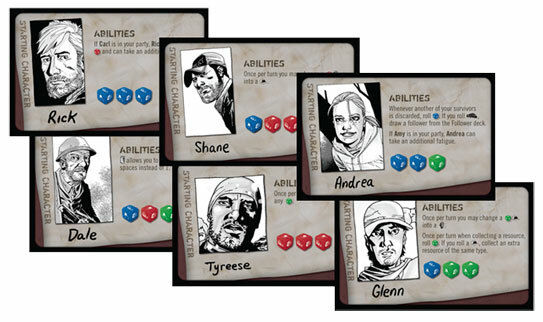 2011Each player takes on the role of one of six key characters from The Walking Dead. With meager resources and only one other companion, each player must travel across north Georgia in search of food, ammunition, gas and other survivors. But…where ever a player moves, the zombie hordes are always right behind them. Who will be the first to scout three locations and find refuge from…The Walking Dead? In 2003 I was living back with my parents in Las Vegas, NV when a comic book show came to town. Nestled among the various booths there was a small set up for a comic I had never heard of. The comic was called The Walking Dead and instead of the book being just about zombies it dealt with how characters reacted to the world around them. Now Z-Man games has made a board game based off the hit comic but is this one game you should pick up or avoid it like a pack of walkers? The game starts out with you selecting one of the iconic characters from the comic. You can choose to be Rick, Glenn, Shane, Dale, Tyreese or Andrea. Once you choose who you want to play you draw a follower from the deck and four location cards (3 public and one private). Then determine your dice pool by adding up the die of your character and your followers. You also start with one food, gas and ammo each and this is important as you will need all of these to survive the game. You can scavenge for supplies by landing on a resource space however, you must draw an encounter card for each resource on that space (for example if there are gas and ammo at a space you would draw two cards). Ammo is used for taking out more zombies but it can also create noise which can draw more zombies to your location. Gas allows you to travel farther than you would on a regular turn (which is to move up to 3 spaces) or can be used to bypass zombies. And food reduces the effect of fatigue on your followers (if any of your followers gets 3 fatigue counters they lose that survivor and if you lose all of your survivors you lose the game). How do you win the game? You do this by scouting locations as you are searching for a safe haven for you and your party to rest. But this is easier said than done as you might have to forage for supplies needed for that location or gain enough followers to take out zombies that are gathered at that location. Combat is resolved by rolling the amount of die in your dice pool and tallying up the results. If you gain equal to or more zombie heads then you successfully defeat the zombies. But if you fail then you must place one fatigue marker for each zombie you failed to defeat. What I love about this game is that you can play this any way you want. If you want to be cooperative and assist your fellow players you can do so. If you want to play an every man for themselves type of game you can do that as well. There are even rules for playing this game solo and that’s VERY rare in board games nowadays. I actually played the game solo and I can tell you that is as much fun to play this game solo than it is with a group. The only complaint that I have with this game is there are no trays included to store the various components. I would have loved to see something like that included with the game but you can use rubber bands to wrap up the cards and small ziploc bags for the pieces. The game itself looks gorgeous and for fans of the walking dead it comes complete with new art done by Charlie Adlard! The game costs around the normal price of a board game of this size and at $39.99 you get a full color game board, 13 dice, over 300 markers and around 140 cards! That is a lot of stuff to be packed in this little box! Games are relatively quick lasting between 30 to 60 minutes and I can tell you if you are a fan of the comic this is a no brainer. Pick up this game and start playing in the world of the walking dead. For this game and other great games made by Z-Man games head over to http://www.zmangames.com to discover more great games by this company. Wow, this game is a good time. Exactly what a Zombie game should be, a constant fear of a million zombies running at you and eating your face off. These zombie tokens are everywhere… there are just so many of the things, maybe it would be better to get tokens for tokens I don’t know but it just makes such a big mess, hesitate to take the game out for that reason alone sometimes. That being said, the production quality is good, everything is punch-cardboard, mostly because of these zombies were plastic you wouldn’t have enough room for them. The characters could have been upgraded to plastic models but, they’re good enough as punch cardboard on little stands. The art style stays incredibly true to the comic series, which makes me smile. The replay value is what really kills it for me. Yes, you can end up with different characters and schemes but it’s the same map every time and tracking from one point to another is really bothersome most of time. The first five, even six times is fun though…It’s a great game. After re-thinking this game, I kind of wish I gave it a 7/10. I need to be able to change that somehow. This game is a little different in game mechanics than your standard zombie game. Killing zombies are not the main emphasis to the game (although you still have to kill a lot of them, lol). You are trying to gather followers, get supplier and find a new place to live so you can exist in the Zombie apocalypse. Killing zombies are just an unfortunate part of your turn to turn functioning. You are never going to stop them and I have never seen a game that has as many zombies in it, the last time we played the board was covered with literally 100’s of them. The other cool mechanic of the game is how easy it is to play while still giving the power gamer his/her mechanic fix. Everything is based off the encounter deck, so it keeps things simple yet it allows for a bunch of different things to happen. You also find equipment through them which I liked too. My biggest beef with the game is occasionally you get a card that had no chance to do anything with and you just fail, but I personally didn’t mind that too much, it did make things more random, but a dice game is random by nature. My son and myself had a couple of games today…. He won both…and loved it!! !…I lost both and didn’t!!! You start the game with 1 main character and 1 follower…you pool together all the dice on all you characters to create a dice pool. Every time you move you have to put a zombie token down…now these are double sided…picture of zombie on one side,and mirrored except you have a number…could be up to 8!!! !.this is the number of zombies you need to fight when you land on the space…you put it number side down so no one knows how many…. You have to collect resources and you move onto a space with a resource on it…and then do an encounter…the encounter card does not need to be successful to get the resource…but some cards if you fail them stop you from collecting the rescource…you do 1 encounter per resource,so if 2 resources on a space…you do 2 encounter card…. If the resource space has a zombie counter on it,you must fight the zombies,then turn over 1 encounter card for each resource on the space. 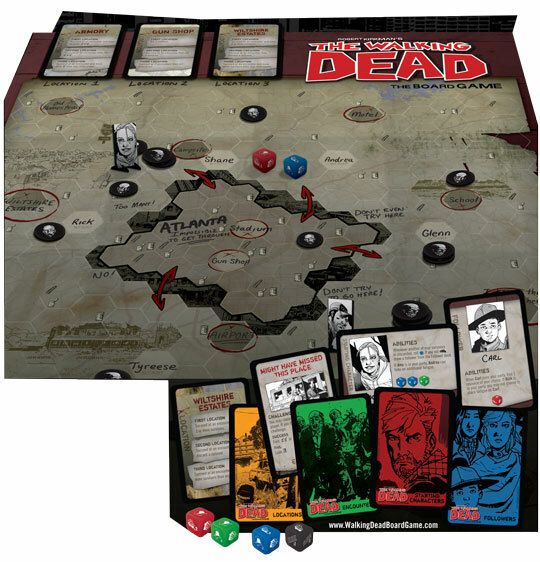 Not to be confused with several other Walking Dead Games, this version is based on the comic and includes artwork from comic artist Charlie Adlard. This has quickly become one of the most played games among our friends. Each player selects a character, a follower, and claims one food, ammo, and gas. Food can heal wounds. Ammo allows you an extra dice to roll that guarantees a zombie kill. Gas lets you move an extra space on your turn (two if you play as Dale). Each turn, you may move up to 3 spaces from your current location on the board. This will allow you to land on a space that has one of the aforementioned resources (or many of them) so you can attempt to scavenge for more. When scavenging, you play an action card and attempt to resolve the issue on it by rolling your dice pool. The goal of the game is to scout 3 of the various locations on the board, each with it’s own set of challenges. This is NOT a short or easy game. If you play till someone scouts 3 locations successfully, you may be playing for hours. We love a long game like that, but some people want a dash not a marathon. You have been warned. To slightly complicate things more, whenever you leave a space on the board, a random zombie token is placed there, implying that the zombies are always following you. If you have 5 people playing at once the board can get filled easily. However, because you can move several spaces at once, this becomes just a minor inconvenience. More so if the dice rolls hit the board. Zombies can and will go flying. What makes this game different each time is that the dice pool each character and sidekick have are all different. Some characters, if paired up, will get special rewards. So, this means you can come back and have a different experience even if the object is the same every time. The flip side to that is, like many dice games, SOMEONE always has a bad game. It never fails that one of us just can’t roll anything worthwhile and has the hardest time completing objectives. If you play this with a bunch of new people, there may be one person who doesn’t have as much fun and will sour on the game if you’re not careful. Having said that, our friends consistently request to play it on board game nights and we happily comply. I love this game and it’s absolutely worth a try. Add a Review for "The Walking Dead: The Board Game"